The Tablet PC - Weighing less than three pounds and small enough to fit in one hand which possesses the full power to run all existing Windows-based software applications while at the same time incorporating the convenience and mobility of using pen and paper. 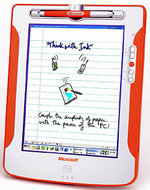 Microsoft Software Architect Bert Keely showed how the Tablet PC, which works with a pen-like stylus, not only transfers handwriting into electronic images but also recognizes handwritten revisions made in Office documents. Users can write on the Tablet PC screen as if it were a sheet of notebook paper and easily add comments to email, presentations or other documents. The written notes are captured as digital ink, so they can be sent along with the documents and stored or sorted without the need to re-enter data via a keyboard. The audience applauded at the sight of Keely moving blocks of text within a document, adding handwritten edits to a sentence and highlighting sections in yellow merely by scrawling the stylus across the flat screen. The audience were promised new Prototypes and More Features in 2001. Fast Forward to the Present. Giving his annual "state of the industry" keynote speech at this year's COMDEX Fall 2001, Microsoft Corp. Chairman and Chief Software architect Bill Gates set out his vision for a "Digital Decade" that will revolutionize the way companies do business, and how people around the world communicate, learn and are entertained. Unveiling prototypes of the new Tablet PC, Gates predicted that the Tablet would become the most popular form of PC within five years. Gates unveiled prototypes of the Tablet PC made by leading computer makers such as Acer Inc., Compaq Computer Corp., Fujitsu PC Corp. and Toshiba America Information Systems, and announced that these machines will go on sale in the second half of 2002. "The PC took computing out of the back office and into everyone's office," said Gates. "The Tablet takes cutting-edge PC technology and makes it available wherever you want it, which is why I'm already using a Tablet as my everyday computer. It's a PC that is virtually without limits -- and within five years I predict it will be the most popular form of PC sold in America." The History of Computers has been pretty interesting. The Huge Monstrous Servers of the 50s and 60s gave way to the smaller room size Work Stations of the 70s and 80s. Desktops brought computing to the general media in the 80s and 90s. Notebooks and PDA's created wireless computing in the 90s and the 21st century. Now, the Tablet PC, a Hybrid of a wireless handheld and a full-featured Laptop.